The City of Rockville, Maryland, the county seat for Montgomery County, Maryland, is located north of Washington, D.C. The City of Rockville is the third largest city in the State of Maryland, behind Baltimore City and Frederick. The Rockville Town Center features numerous restaurants, bars, an ice skating rink, and events. Maryland State Police patrol I-270 outside of Rockville. Montgomery County Police aggressively enforce drunk driving laws on Rockville Pike, and watch venues like TGI Friday's, Hooters, and the Clyde's on Tower Oaks Boulevard for drunk drivers. Rockville Police patrol the streets of the City of Rockville, and Maryland National Capital Park and Planning Police, Metro Transit Police, and Gaithersburg Police also file charges that end up in Rockville. Leonard R. Stamm lives in Montgomery County and provides representation to drivers charged with driving under the influence (DUI) and/or driving while impaired by alcohol (DWI), serious motor vehicle offenses, and criminal offenses in Montgomery County, Maryland. He has been doing so for almost 30 years. He is the author of Maryland DUI Law, the authoritative text on drunk driving law in Maryland. He is a former president of the Maryland Criminal Defense Attorneys' Association. He also the Dean of the National College for DUI Defense. (Click here to read and watch a video of his Dean's Address). He is rated "AV-Preeminent" by Martindale Hubbell, recognized as a Super Lawyer, and a Best Lawyer. He is also given a rating of "10-Superb" by Avvo. It is unusual to see a case where there is not some defense available to beat or reduce the charges. In most cases, prosecutors offer plea deals that are no better than what would happen after losing a trial. So there is usually little downside to fighting the case in court and at the MVA. Unfortunately, most lawyers in Rockville assume the case is too difficult to win in court or at the MVA and fail to challenge the State's case. Some lawyers never challenge the State's case. This can be a huge mistake since most DUI cases have issues that can be raised in defense, and with zero or very minimal penalty. In other words, the result of fighting and losing is rarely worse than just pleading guilty or not requesting a hearing at the MVA. So why would you want to choose a lawyer who will not fight your case? When interviewing a lawyer, you should ask if your lawyer intends to fight the case, and if not, why not. Leonard R. Stamm represents clients throughout Montgomery County, Maryland, including: Ashton, Aspen Hill, Bethesda, Boyds, Brookeville, Burtonsville, Darnestown Maryland, Montgomery Village, Mt Airy, Gaithersburg, Germantown, Laurel, Laytonsville, Leisure World, Olney, Poolesville, Chevy Chase, Clarksburg, Comus, Damascus, Potomac, Rockville, Silver Spring, Takoma Park, Wheaton, and Woodbine charged in Rockville, Maryland by Maryland State Police, Montgomery County Police, Park Police, Rockville City Police, Gaithersburg Police or Metro Transit Police with driving under the influence (DUI) and driving while impaired (DWI) by alcohol. 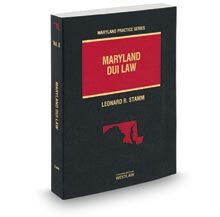 Be represented by the criminal lawyer who wrote the book on Maryland DUI Law, literally. If you have been charged with a DUI or DWI call 301-345-0122 for a free consultation.